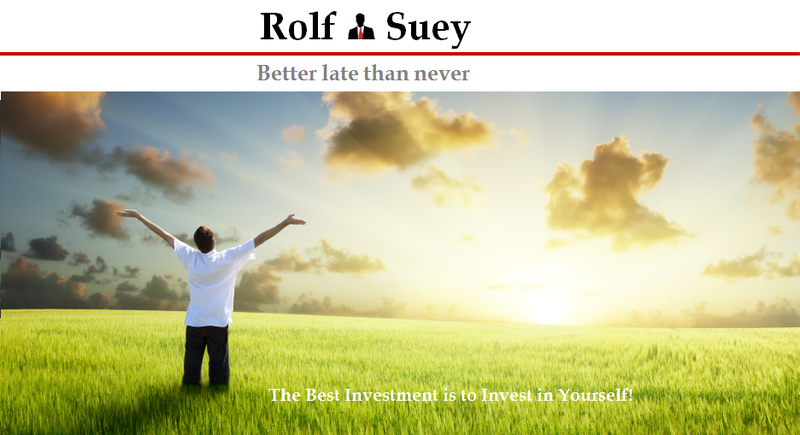 Rolf Suey - Better Late Than Never: Crisis? We should be happy because it is the best time to learn! First of all Happy CNY to all the readers! May this Golden Monkey jumpstart your year with loads of Joy, Happiness and Prosperity! 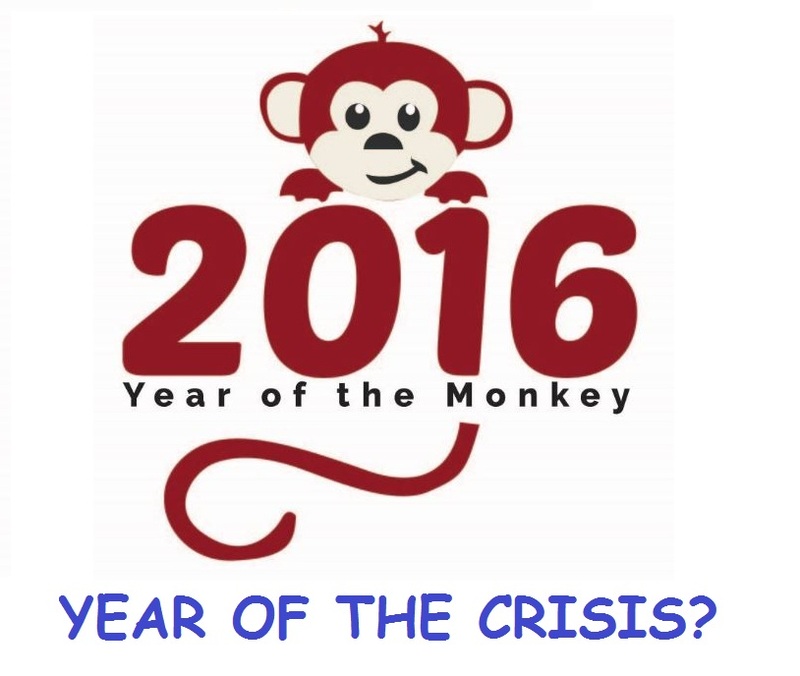 Is 2016 or the Monkey year doing great so far? Not quite! 2016 started on a bad note. Global stock markets plunged due to oil price rout and China’s economic slowdown. ISIS problem proliferated with Jakarta bombing last month. North Korea recent rocket launch put further strain to US-China relations. Taiwan’s opposition presidential victory also does not seem to do any good to improve the cross strait relations. In Hong Kong, a riot broke out during Lunar new year between civilians and police, which many believed it is more than just a fight over unlicensed fishball stalls, but an activist’s fight of autonomy from Beijing's control. Then there is Taiwan’s building collapse due to earthquake, and just yesterday, two passenger trains collided in Germany. 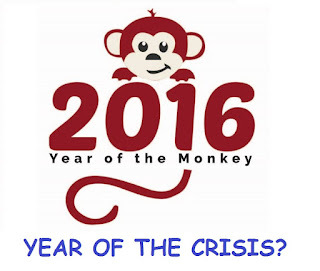 Apparently, it seems like we are already entering into a crisis in 2016. So should we fret and fume over it? Perhaps not! Crisis is the best time to learn! In fact, I am thankful to be able to go through many crises in my life, and each time emerged stronger than before. Crisis in mandarin is referred to as 危 (wei) 机 (ji). When “危(wei)” and “机(ji)” are read together as one word, it means CRISIS. Separately 危 (wei) means danger while, 机(ji) means opportunity. Therefore if we are positive, and can see the other side of things, opportunities can emerge from crisis! In the following, I will discuss some of the crises in my life and what I had learnt from them. Since the start of the year, STI has plunged below 2600, nothing seen since the financial crisis of 2009. Should we worry or should we buy? Personally, I picked up many bargains and made more than ten of trades deploying a fair share of my cash warchest! I view the current sell down as a buying opportunity, considering that I had been very patient and relatively dormant in the last 4-5 months. While I am buying sparingly, I am prudent and still keeping more than 50% of cash to take advantage of further plunge, if it does happen. I think I am on the right track, because this execution of warchest was planned for since last year. And I am feeling extremely good now, and definitely not losing any sleep despite the sea of red in my portfolio. See below two of my articles lately. My first career crisis was 2003 SARs where I had a hard time looking for my first CPF paying job. You can refer to my article “My First Paycheck 11 Years ago compare to Fresh Graduate Salary Today”. Imagine if I graduated during better times and can be choosy and negotiate a higher salary. Is it really good? Not that I think of. Instead I am extremely grateful to graduate in a time of crisis. This is because otherwise, I will not have learn how NOT to take for granted of having a job. Next was 2009 GFC. My company announced layoffs and shutting of plant. Contracts signed were either cancelled or postponed. I survived and was not on the axe list. One reason is maybe due to my sales role, which is deem important during crisis. To create value in spite of the slowed order intake, I turned my attention to existing projects negotiating favourable postponement deals with clients, and also look into how we can swop the components/equipment for the postponed or cancelled projects for new upcoming projects at a good price for other clients. My company survived the crisis and later go on to do well due to the oil price rebound. Contrary to common beliefs that I can be retrenched or have my pay deducted during GFC, instead, I received one of the biggest promotions in my career within less than a year after the crisis outbreak. Now, the Oil crisis – the industry I worked in! Friends and colleagues were already retrenched. Refer to my earlier article “Retrench during Oil Crisis! Why?” Yes, the industry is really bad, but I am seeing some positive reassurances for my company. For instance, our core business is not in O&G, and that sector is doing really well since the start of the year. Also, we had been prudent in the last five years, where we build up a rocked solid balance sheet. Personally, last year, I had anticipated the “worst to come” and took on bigger work scope despite no pay increment. Refer to my earlier article “Oil & Gas Crisis – Time to Take On More Work Even with No Pay Raise!” As projects get lesser, I had also spent considerable time focused on building internal relationships and more importantly the few meetings/dinners with the higher management were really good. Currently, I am working on internal business initiative to optimise cost of our product, and it is keeping me really busy. Overall, despite the downturn, I am seeing quite a lot of opportunities during this crisis for myself. Apparently and counter-intuitively, the start of 2016 has been one of the busiest starts of the year for me. Nonetheless, I am not saying that the “brutal axe” will not unexpectedly happen to me. The point is even if it happens; I will be mentally and financially prepared. Now, I am just cautiously optimistic. Aside from macro-economic driven crisis, there are also self-inflicted career crisis, such as making wrong decisions in jumping into a wrong company at a wrong time. Many years ago, being young, ambitious, and sometimes ignorant, I yearn for even faster success. While doing very well in the then existing company, I leapfrogged to another company with a bigger role sitting at the top of the organization chart. Not knowing exactly the pitfalls, the scale to peak, took a tumble eventually. It was a failure and it seems to be a bad decision then. Yet, looking back today, it was one of the best things that happened, not because I learn a lot in work. But even more important, it was a turning point for me, as I took time to reflect on what went wrong then, and vow not to repeat the same mistake again. In addition, I learnt that a single tap of income is not sufficient and job is never stable, no matter how stable it looks on the surface. Also, career, money and power are not the most important things in our life. As a boy, my family struggled to make our means. Being poor back then taught me a lot on the “value of money”. It also motivated me to study and work harder in order to earn a better living. This is when I started to learn how to earn at a young age, such as selling stuffs, part time job, giving tuition etc. You can refer to my personal finance story as follows. In Part 1 of my Personal Finance Story, and also here, I mentioned how I was addicted to soccer betting at age 20, and eventually suffered a substantial loss of all my savings during my army days. No doubt the loss was painful, but till this day, it serves as my best reminder not to “gamble big” ever. PS: I do not consider my stock investments as gambling! In Part 2 of my Personal Finance Story, I mentioned how I chalked up debts of $40k (incl. interest) prior to graduation - tuition fee loan, study loan, computer loan. Well, these loans may seem reasonable. Firstly, I do not have any family financial support and secondly, I had a girlfriend who depended a lot on me financially back then. Having said so, I was actually having a relatively good part-time income from tuition at that time, which some of the debts can be pared down if not my overspending. Today, I learn never to be overleveraged. But that is not to say that debt is bad, for a good debt can work in your favour if you know how to use it correctly. I had taken few rough rides in my relationships. Each time, I become emotionally stronger and learn to handle it better than before, albeit not perfect! I also learn that while “breakups” can be extremely heartbreaking, it is sometimes necessary, so that we can move on in our life. From young age, I never considered myself someone who was blessed with good health. And yet, I also never really take care of my health back then, often eating unhealthy food, smoke, drink alcohol and have late night sleeps. When I was thirty years of age, a near-death incident with weeks of hospitalisation taught me to treasure my health and love ones more. It also changed my mind-set about life to be more humble. It comes at exactly the right time in my life when I am getting too arrogant from an exponentially growing career. My "VALUE?" stocks keep plunging. What should I do? My Major Stock Portfolio Selloffs in 2015 - I use more "Gut" than "Logic"! I am not a Christian, but somehow I find out that what I learnt/believe in life is exactly similar to biblical teachings. I felt amazed! Interestingly, I was told by someone I respect that God created everybody w/o illness in the purest form. The illness we had, is a fear imposed by satan to test ur faith. Worry and fear created by satan is the main cause of many of the illnesses n then death painfully! As long as u stay 100% faithful in God, and believe all humans r created w/o illness, even the minute just before u r almost dead, u ll be miraculously recovered. I had read a book many yrs ago while in the hospital and inside are all the testimonies of miraculous healings! True story of people I know and Remarkable! Hope this short comment is helpful to u. So many crisis in your life. I am sure it made you a better person now with much higher self awareness. Bravo. Lot of things you can impart to the society. Having said the above, please avoid "unnecessary" crisis from now on. haha. For example, you don't need to get hit by a train to know it is fatal. I hope we can all use opportunities to improve our health (physical, financial, family) and live our fullest before we say bye bye. Frankly, I have not include the many accidents I had, which I was admitted to hospital a few times having stiches on head, chin and injuries on my legs and hands. And also several car accidents, of which I encountered one which involved police and ambulance, causing hours of jam in the expressway. Hahaha….ok enough of all the crises. You know that is not my point of this article. It is just an encouragement to stay mentally strong and positive during our low period. I promise not to add unnecessary crisis and definitely will not get knock by the train. But you must promise not to be so Frugal! And its still Lunar New year, how can you use the phrase “before we say bye bye!” Haha…. Talking about frugal, I don't mind to be spendthrift by spending 2 millions dollar on a landed property at the desired place, but no money leh. So, continue to lead my satisfied middle class lifestyle. Ok lar.. I get it... difference of frugal and cheap is just a thin line apart. Happy jump, tired sit, sleepy sleep. This part I like that SMOL philosophy of taking things easy. A lot of people don't like to share what they have "paid" for success. P.S. Your recent "peeling the onion" posts are very interesting. Enjoyable read! I cannot withstand the hammer and anvil lar, because I am not man of steel. You or fisherman probably can! LOL! Please don’t get me wrong, I am not complaining of my difficult path. I am actually happy things happened, so to be more appreciative and humble. Of course, I don’t mind a rich wife or strike Toto, but if I am not destined to it, I also cannot keep daydreaming or fret over it. Ok next post I scatter “laughing powder”. Peel onion too sad! Haha. Finally, to those who would persist in disseminating the potentially perilous, fundamentally fallacious theory that “crisis” = “danger” + “opportunity,” please don't blame it on Chinese! This essay is by Victor H. Mair, professor of Chinese language and literature at the University of Pennsylvania, with contributions from Denis Mair and Zhang Liqing. © Victor H. Mair. i believe you are one of them. Nevertheless it is also very true if you are prepared no matter how dangerous the situation is , you will most probably survive. The bonus is you will become a better person. And the next crisis comes (next market crash), so what man? Not that we like crisis but life can throw a screwed ball at us, when we are least expecting it. i think you will do very well finally in the Stock Market from your mental strength you show in your writings. Who am i to judge and say so? But it is just my strong opinion of your mental strength. Remember you wrote about how important the mental strength of a person in order to succeed in life? - During a crisis, take appropriate action and stop losing sleep or losing yourself. - After a crisis, forge the right mindset and learn from it to emerge strong next time. Thank you and may peace be always with you and your family. God bless! Lose money during crisis how to be happy? In a crisis of stock market crash, only the shorting traders make money. On the other hand if shortists short too much, they may be killed by a short squeez. The rest of us just wait for the desert sand storm to pass. If you are forced to sell, then most probably there is something wrong somewhere in the first place. Need to do more thinking before you put your money in the market, the next round. Maybe you still have capital, you can pyramid down all the way provided if you are prepared to catch the falling knife. And you have the patience to wait till the durian falls after catching the falling knife. Lose money of course sad! But bo bian leh... the 21st century is more and more unpredictable, hence sometimes just need to inject some "mental reassurance", so that next round come back stronger! Can diamond strategy work instead of pyramid? Very interesting - diamond strategy? Diamonds after cutting come in many shapes. Diamond shape in poker card = top and bottom narrow, mid section fat? combination of 2D pyramid down and up! Diamond hardest element than pyramid = strong portfolio that can weather the storm in either ways! Multiple facets = flexible when situation changes! Can even reflect light = reflect mistakes and life? U heard about Charlotte Ehinger Schwarz diamond? More than a century facets. I bought it as proposal ring for my wife. Small in carat size but so pretty! Your imaginations are really powerful. Of course we pyramid down then pyramid up Ma. And your Wife is really fortunate for your imagination, err...i mean diamond. small small Damond for her only 0.25c nia. She complained now liao, why so small! I am unfortunate now! Initially thought one price depreciate over a lifetime of marriage (assuming all smooth smooth). Now possible to be two prices! By the time I finish reading your whole story and what you've gone through, suddenly I don't feel there is crisis in the world right now, at least not yet. You certainly gone through a lot in your life and while some things are difficult, you made the best out of the situation and came back stronger. Kudos to you and you will have no problem mentally on going through this round either. Thanks for the compliment and I am sure you have the right mindset and mental to go through crisis as well. You stand out the most among all who is chasing for FFF! Ooops…. FD on par too! Speaking of going through a lot, I just watched on TV, a serial about Bryan Wong getting a taste of work in Indiak. There the Indians work 16hours a day just to earn S$2 doing laundry manually. The one who iron clothes works 365 days a year, without any rest day. If he rest, he will not get paid for the month. Even if he is sick, he has to work. Given our good life today and after managing India/Indonesia for a couple of years, I always think every person in their lifetime really ought to go India or Africa at least once to see what tough life is all about. I agree it is far from crisis now. I wrote in one of my previous post about my younger colleagues being retrenched, and on their last day, I gave no talk/advice. This is because I prefer to say what is necessary before the actual crisis arrived. So you can see so many of my recent posts on crisis…. Haha…. This a great post. Thank you for sharing. I hope to see the day when we all can look back at this period and say that we learnt something important with no regrets. Thanks for dropping by and the compliment. Losing money unexpectedly and going through pain now is undoubtedly sad. We r only human so pls cry over it. But how fast we get over it and the ability to admit the mistake and learn the next time, DIVIDES mediocre and the great. Like u say, no regrets and learnt. What we lose today, we promise ourselves to win back more going ahead.